Figure 7-18. - Three-phase starter controlled by a float switch. push button, the float, the pressure, or the limit switches, are connected between line 1 and the holding coil. The normally closed overload contacts are always located between the holding coil and line 2. A wiring diagram usually can be found in the cover of the controller. Now it has been established that the motor and line voltage are in working order. This checking has narrowed the problem to the control circuit and the chance that some components are open. You can locate opens in the control circuit with a voltmeter. Connect one lead of the voltmeter to line 1, and touch the other lead to first one terminal or the holding coil and then the other terminal. There should be the same voltage reading that is read between line 1 and line 2. If the control circuit voltage is supplied with a transformer. the voltage read should be that of the transformer output. If there is no voltage on either side of the holding coil, the overload contacts are open. Pushing the RESET button should close the overload contacts. If they do not close after they have had time to cool. they may be defective. In this case. they should be replaced. If there is a voltage on one terminal of the holding coil but not the other, the coil is open. You must then replace the coil. If there is a voltage on both terminals of the holding coil, the coil and the overload contacts can be assumed to be in working order. To double- check these components, short out line 1 and the terminal marked 3 with a piece of wire. This action will bypass the external control, and then the holding coil should close the contacts. You can use a current- limiting resistor in place of a w-ire. If the control functions, the problem is in the external controlling device. Solid-state controllers have very complicated circuitry; thus, troubleshooting these units requires a good background in electronics and electric motors. These controllers have repair instructions with them as well as a list of parts that should be stocked for repair purposes. Repairs consist of replacing boards or modules that plug into the circuity. A combination starter consists of a magnetic starter and disconnect switch mounted in the same enclosure. These starters are supplied with either a fused disconnect switch or a circuit breaker. The fuses (or circuit breaker) provide short-circuit protection by disconnecting the line. A combination starter and circuit breaker will prevent single phasing by simultaneously opening all lines when a fault occurs in any one phase. This type of starter can be quickly reset after the fault has been cleared. Figure 7-19 shows a fused combination starter. Figure 7-20 shows a combination starter and a thermal-magnetic circuit breaker. We will now show you a number of control circuits with various combinations of push-button stations. A!! of these diagrams use one type of magnetic switch, but others can be used. 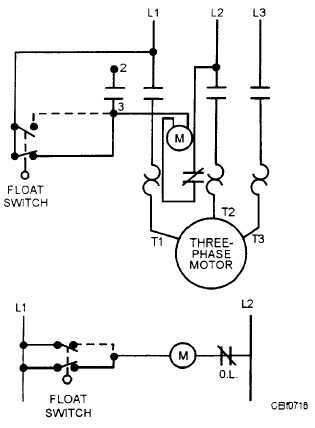 Figure 7-21 shows a magnetic switch that is operated from any of three stations. Figure 7-22 shows a straight-line diagram of the control circuit of three start-stop stations. Figure 7-23 shows the control circuit of two start-stop stations. In these diagrams, the START buttons are connected in parallel, and the STOP buttons are connected in series. These button connections must be done regardless of the number of stations. Note that the maintaining contact is always connected across the START button. All STOP buttons are connected in series with one another and in series with the holding coil, so the motor can be stopped from any position in case of emergency.